Eva's Village a Paterson, NJ, anti-poverty, nonprofit organization, partners with local religious organizations to raise funds for its twenty integrated programs to assist those in need. 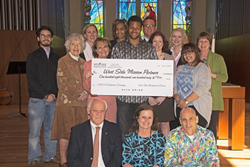 Eva's Village and 4 other mission partners receive proceeds from West Side Presbyterian Church's '10 x 10' Lenten Campaign. “West Side Presbyterian’s generous donation will have a tremendous impact on the hundreds of men, women and children we serve each day,” noted Marie Reger, Executive Director of Eva’s Village. Eva’s Village was one of five mission partners chosen to receive a gift of over $20,000 from the West Side Presbyterian Church’s “10 x 10” Lenten Campaign. Nancy Simpson, Chair of Missions and Social Concerns at the Ridgewood church, explained that partners were selected because of their work with the homeless. Covenant House NJ, Family Promise of Bergen County, Youth Self Development, Paterson, & Pwojé Espwa Sud Orphanage, Haiti, were also chosen as mission partners. “These are all places where West Siders have had hands-on experiences helping and feeding people,” Ms. Simpson noted. “West Side Presbyterian’s generous donation will have a tremendous impact on the hundreds of men, women and children we serve each day,” noted Marie Reger, Executive Director of Eva’s Village. In addition to supporting the Community Kitchen, the donation will support Eva’s 20 Food & Shelter, Medical & Recovery, and Education & Training programs. “We are also grateful to members of the congregation who volunteer regularly in our Community Kitchen,” Ms. Reger added. West Side Presbyterian’s congregation has supported Eva’s Village for more than two decades and has increased their commitment as donors and volunteers over the past several years. Each mission partner was invited to speak to the congregation during the campaign. An Eva’s Village alumnus described how the food, shelter medical and recovery programs at Eva’s helped him find a path to recovery and a new life. The congregation exceeded its goal, collecting more than $100,000 during the 40 days of Lent, between Ash Wednesday (February 10) and Easter (March 27). The amount represents 10% of the church’s income and re-establishes its tradition of tithing to serve those in need. Named “10 x 10,” the drive celebrates the 10-year anniversary of West Side’s sanctuary, rebuilt after a fire in 2002. Congregants were encouraged to participate by “tithing” – donating 10% of their income to the campaign. Children were encouraged to collect change to help meet the goal. Founded in 1912, West Side Presbyterian Church is a community dedicated to connecting with individuals, groups and families through innovative ministry that supports healthy emotional and spiritual growth. The church supports 10 local charitable organizations and an orphanage in Haiti through donations and volunteer service. Founded by Msgr. Vincent E. Puma in 1982, Eva’s Community Kitchen began by serving 30 meals a day in Paterson to feed the hungry. In response to the related issues of poverty, addiction, mental illness and homelessness in the community, over the decades additional programs and services grew out of the Community Kitchen to become Eva’s Village, a non-profit, social service, anti-poverty organization that is one of the most comprehensive in New Jersey. For more than 30 years, Eva’s Village has carried out its mission to feed the hungry, shelter the homeless, treat the addicted, and provide medical and dental care to the poor with respect for the human dignity of each individual. Today, Eva’s Village helps thousands of individuals rebuild their lives each year through 20 integrated programs addressing needs in the community for Food & Housing, Medical & Recovery Services, and Education & Training.